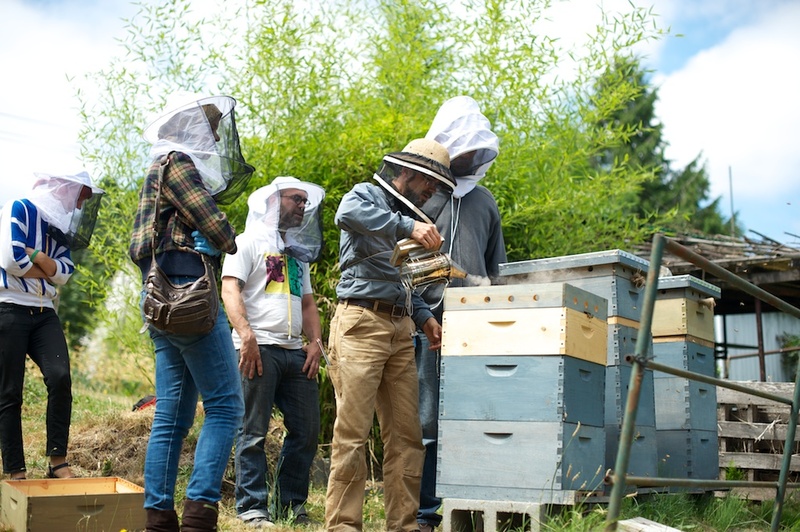 Redmond wasn’t talking about waiting to catch a flight out of town, but rather tending to another group of hives that he, along with several other Seattle-based beekeepers, host at the Seattle-Tacoma airport. Under the umbrella of The Common Acre, a non-profit founded by Redmond that promotes “public programs at the intersection of earth and art”, he and the other beekeepers spent two years consulting with various airport employees regarding the complicated security and logistical questions that arise from placing hundreds of thousands of bees near a busy airport tarmac. This spring, they installed 20 hives on the airport’s property, and are in the process of transforming 50 acres into a beneficial pollinator habitat. 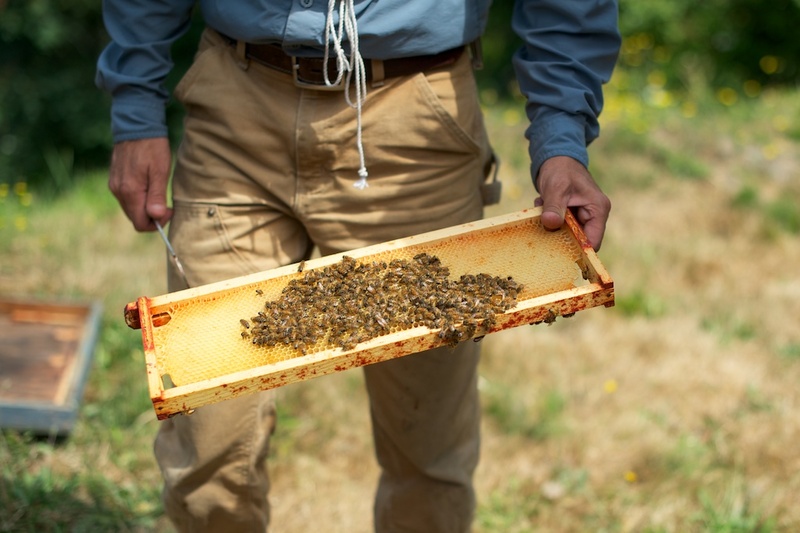 Thanks to a recently funded Kickstarter project, the beekeepers now have a small financial cushion which will allow them to use the hives’ controlled location to breed hardier bee-stock for other Pacific Northwest beekeepers. They also plan on educating and entertaining thousands of airport fliers about pollination and honeybee health through art and media exhibits. 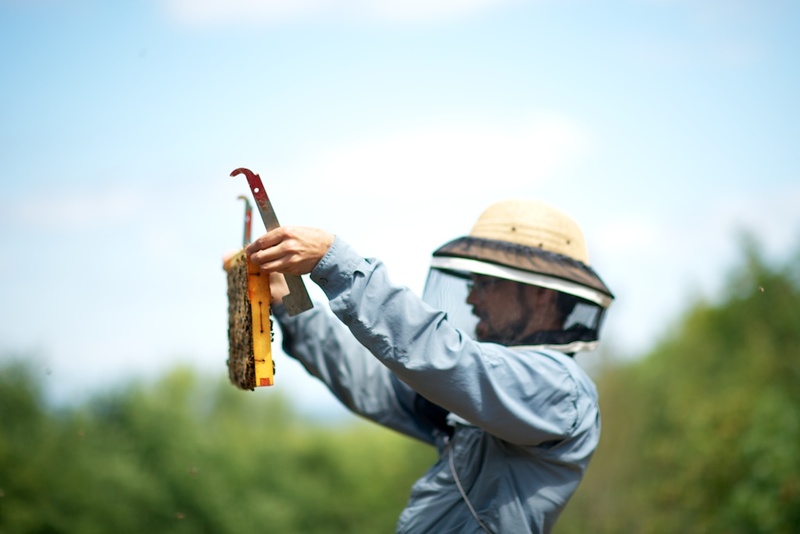 Redmond likens his attraction to beekeeping as something akin to the loneliness of the long distance runner: the practice grounds him and connects him to a complicated system that reveals itself in deeper ways the longer he quietly observes. 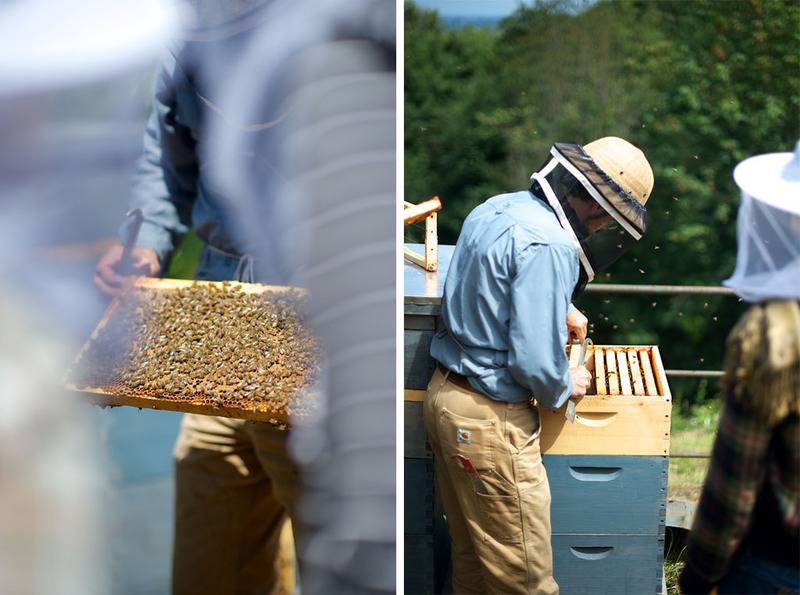 “The good beekeeper just watches – you can tell so much,” Redmond shared. While we chatted before the class, we watched the honeybees’ activities. As a non-beekeeper, I could easily see a flurry of activity, including bees taking off and others landing with bright orange pollen attached to their bodies (their own miniature airport, if you think about it). But I didn’t see everything Redmond saw, including guard bees designated to protect the hive from yellow jackets. Or how the incoming bees weren’t landing as gracefully as they normally do. 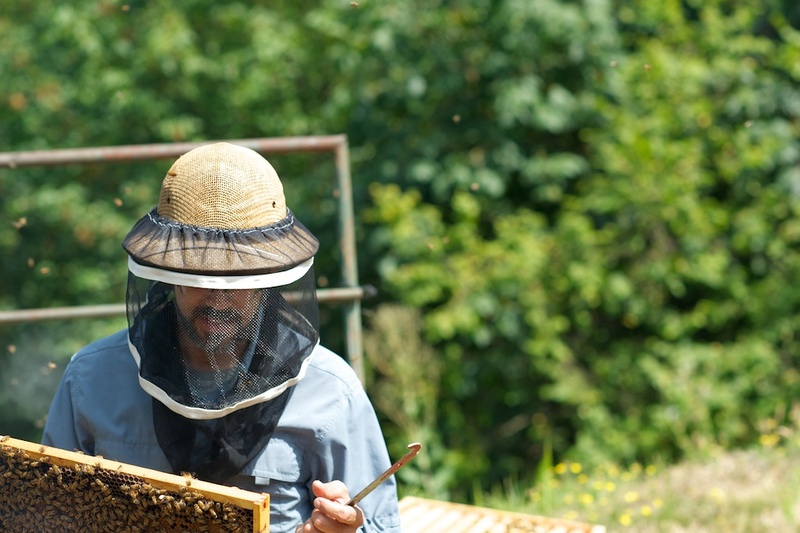 Although Urban Bee Company is a mere four years old, Redmond talks about beekeeping with the understanding of someone who’s studied the craft for decades. Redmond operates outside our frantic, attention-seeking culture. He wasn’t teaching the class to show off how much he knew, and though he’s pulled in many directions with Urban Bee and The Common Acre, he was completely present at the class. He answered everyone’s questions thoroughly and without condescension; he sometimes paused in the middle of our conversation to watch the bees and muse about tracking their movements. After time spent as a social worker and an arts manager, beekeeping marks Redmond’s third career, and it’s one for which he seems incredibly well-suited. He admitted to being frustrated by the chaotic nature of social work, and how one’s personal desire to shine often overpowered a desire to use the arts for social change. After struggling with those aspects in his former careers, Redmond quickly – and happily – recognized that beekeeping presented a tactile crossroads between his interest in the arts and his desire to positively affect society. “It’s got a social impact, it’s interesting, and people want to get involved,” Redmond added. Before he fully recognized beekeeping as a fitting intersection between the realm of art and social work, Redmond’s “eye-opening” moment came while reading about Colony Collapse Disorder. He describes his path from curious to passionate beekeeper as singled-minded once he realized that beekeeping was “all he wanted to do, like a self-guided PhD program”. In quick succession, the original three hives Redmond housed on a friend’s property morphed into 15, and then 25. 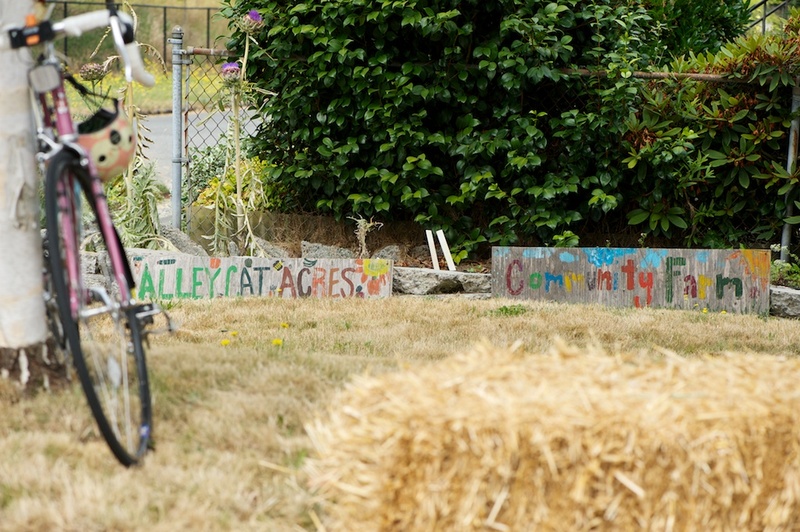 In four years, Urban Bee Company has grown to include delivering honey on bikes, partnering with community food organizations around the city like Alleycat Acres (where the beekeeping class took place) and the new Beacon Food Forest, educating consumers, and of course the larger-scale airport project. Yet growth is an interesting topic with Redmond: he wants his impact to be in his own local ecosystem, and he wants this impact to have limits. Redmond has no interest in scaling his business so he can “sell honey in Brooklyn”, as one friend suggested. Part of Urban Bee’s model is to demonstrate that things are finite, and not everything is available all the time in unlimited quantities. 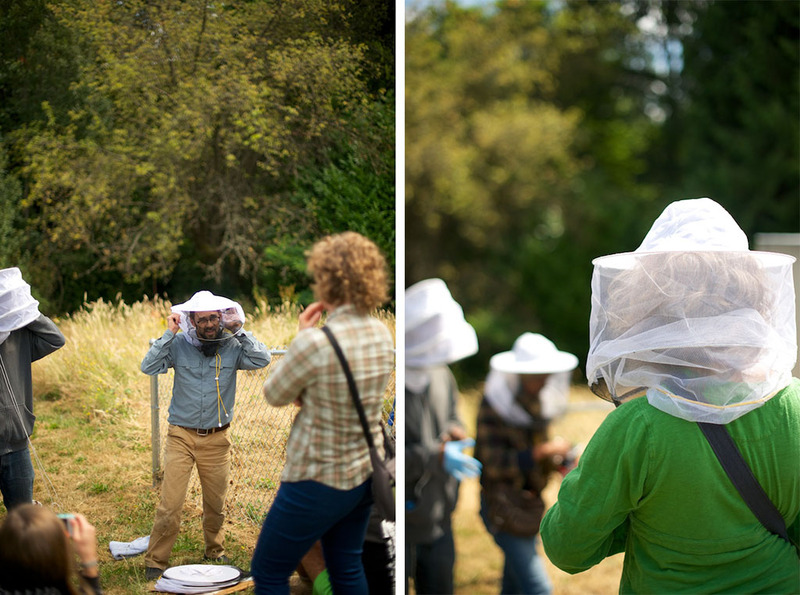 This is where Redmond, and similar smaller-scale beekeepers, diverge from commercial beekeeping, and where the conversation around colony health, Colony Collapse Disorder, and our industrial food system takes an important turn. In explaining the scope of commercial beekeeping, Tom Philpott writes that “it’s common practice for large-scale growers to rent mobile honeybee hives from commercial beekeepers for pollination purposes." Some of these commercial beekeepers keep as many as 6,000 hives. One such operation profiled in a recent Time piece on bees was responsible for pollinating 1 out of 10 apples grown in New York at the height of its operation. These commercial beekeepers truck the hives miles away into vast fields planted with monocrops (almonds, apples, cucumbers, blueberries, etc), place the hives in the fields for several weeks, and then truck them out. In the process, these bees are uprooted from their original home, disoriented, and scrambling to organize themselves into a cohesive unit that can bring nectar back to the hive. The bees don’t care if they’re pollinating a crop or a flower – their focus is the health of the hive and feeding themselves a variety of forage. When the hives are placed on a conventional farm with one kind of food, the actual nutrition they gather is slim. The disruption to the hive combined with this limited nutrition can compromise the bees’ immune systems, effecting both the strength needed to forage and the bees’ ability to ward off disease. And because most of the monocrops these industrial bees pollinate have been sprayed with a variety of pesticides and fungicides (one pollen grain contains 9 different pesticides), it’s less shocking that Colony Collapse Disorder is a reality, and more surprising that such a disorder isn’t more wide-spread. One class of pesticides, neonicotinoids, have received a great deal of attention as playing a prominent role in bee deaths. “Neonics” stay in the ground for decades, contaminating soil and groundwater, while remaining on the very plants bees pollinate. These pesticides can make bees vulnerable to other stressors, as well as cause the bees to become disoriented and have trouble navigating for forage and back to the hive. The European Union has temporarily banned a few of these neonics, in an attempt to see if bees’ health improves, but neonics are far from the only culprit in Colony Collapse. Fungicides have started to show up in bee pollen and, according to this research, make bees more likely to succumb to Nosema, a fungal pathogen. And our current industrial approach to fighting one of the other detractors to hive health, the Varroa mite, seems to be backfiring. The applied miticides “appear to be unwittingly helping [Nosema] gain a foothold”. This mechanistic approach to beekeeping in an industrial system is not about the bee, it’s about what the bee can do. If hand-pollination wasn’t so laborious and time-consuming, the conversation around bee die-off would be much different. In fact, researchers at Harvard are currently working on a robot bee ("robobee"), which could eliminate the need for an actual bee in commercial agricultural settings, where the end goal is simply pollination. 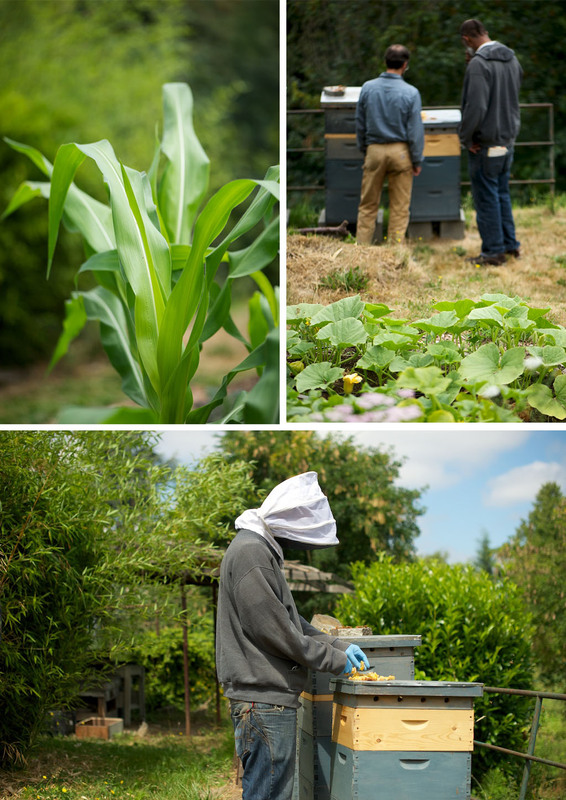 For Redmond and similar beekeepers, the purpose of beekeeping isn’t crop pollination or mass honey production. These beekeepers keep bees that pollinate a variety of plants, and if the hive is in the radius of a farm or garden, vegetables and fruits. 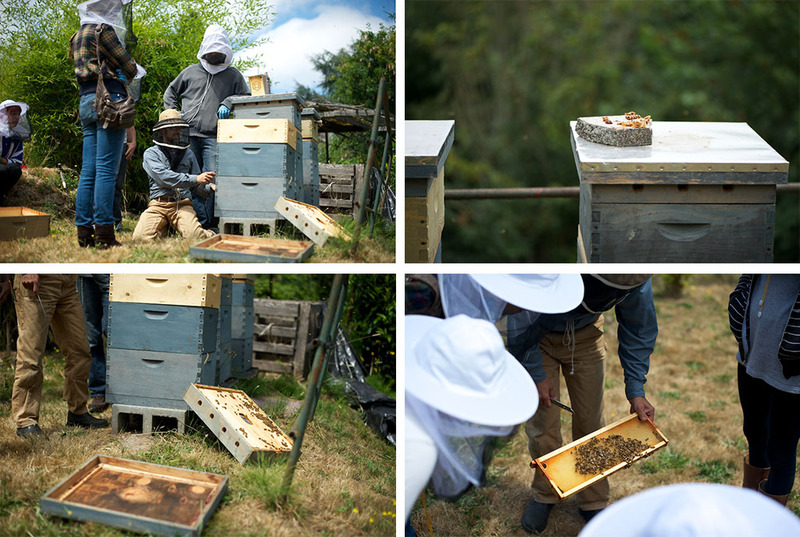 But the real point of these small scale beekeepers is to contribute a vital and healthy component to the ecosystem and community that surrounds the hives. Sure, they keep bees for their honey, but they also maintain beehives to foster species preservation and native plants, to influence a community’s health, and to offer a tangible example of the role of one’s own actions in an ecological network. Unlike large-scale commercial beekeeping and industrial agriculture, Redmond gives more to the system than he removes. Instead of employing chemical warfare, Redmond places his hives in locations that have a variety of forage. Instead of applying a miticide to ward off Varroa, Redmond attracts the mites with drone cells. Instead of maintaining 6,000 hives, Redmond has 25. And, most impactfully, instead of moving the bees around as cogs in a machine, he’s cultivating an ecosystem where all members of that system – plants, animals, bees, and humans – can live healthier lives. He harvests the bees’ excess honey, but he doesn’t try to harvest more than is healthy for the hive, or sell it at prohibitively expensive prices. 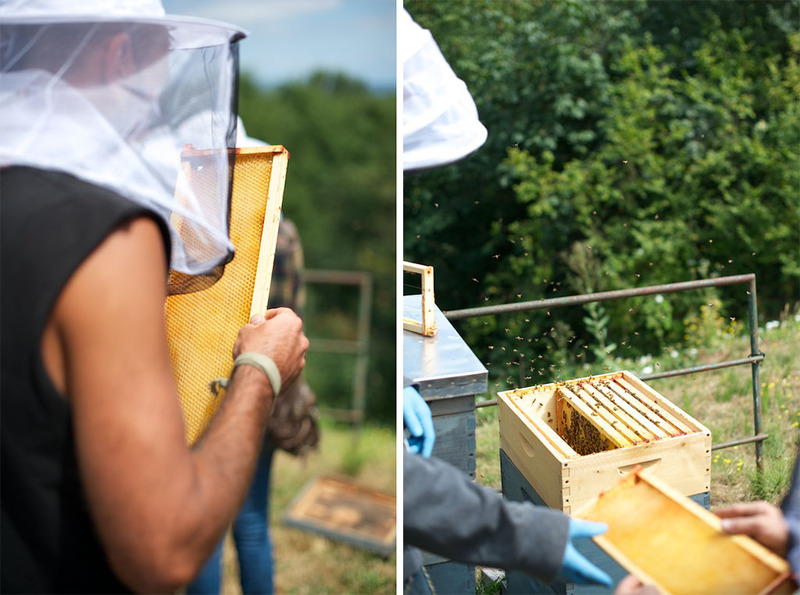 Urban Bee’s slogan is “community through hive”, and the resulting honey is consumed by the community near the hive. Redmond doesn’t view the causes of Colony Collapse Disorder with rigidity: in fact, he thinks it’s ludicrous to believe that partially banning one kind of pesticide would automatically lead to the honeybees’ health rebounding. Hannah Nordhaus, author of The Beekeeper’s Lament, has written that “reflexively blaming pesticides for all of the honey bee’s problems may in fact slow the search for solutions.” Redmond clearly agrees, sharing that “bees have the [same] autoimmune and neurological diseases that we have. It makes it easier for the other viruses and fungi to come decimate the hive." He continues, “CCD is mostly endemic to industrial bees. Even in the two weeks they might have them in those crops, it might just be that no bees are being born because the queens are inbred and aren’t laying viable bees." Redmond keeps his own hives healthy through an integrated approach that combines an awareness of environmental factors and quiet observation. For example, he explained that warmer, damp winter climates foster nosema and lead to bees both eating more and wanting to go outside (even though there’s nothing to forage). To counteract this, some beekeepers in Washington have started to overwinter hives in abandoned apple warehouses, where the temperature hovers around 38ºF. Or consider how he deals with Varroa. In contrast to Monsanto, which is working on an RNA-interference technology that “can kill the Varroa mite by disrupting the way its genes are expressed”, Redmond uses the non-mating drone bees to the advantage of the hive’s health. Varroa mites wreak havoc on a hive by laying eggs in the larger, uncapped brood cells and hatching with the bee. By not putting a foundation in some parts of the hive, worker bees build larger drone comb in those frames. Mites tend to go to these larger drone cells, so Redmond puts all of the drones in one place and then cuts the brood out before they hatch, allowing the mites to hatch outside of the hive. When a hive becomes overcrowded, half of the bees will leave, taking the queen with them, a process known as swarming. In discussing this process, Redmond described a beehive as having a “unified intentionality". The hive operates as one unit, but never irrationally or sporadically. Whether wittingly or not, “unified intentionality” is also an appropriate term for how Redmond runs Urban Bee Company. He recognizes that there isn’t a blanket answer to Colony Collapse, or just one deterrent to Varroa, or only one way to reach people. He’s also aware that he isn’t the only voice in the company and that operating in isolation isn’t sustainable to Urban Bee’s health or message. If you click around Urban Bee’s website, you can see this intentionality firsthand. 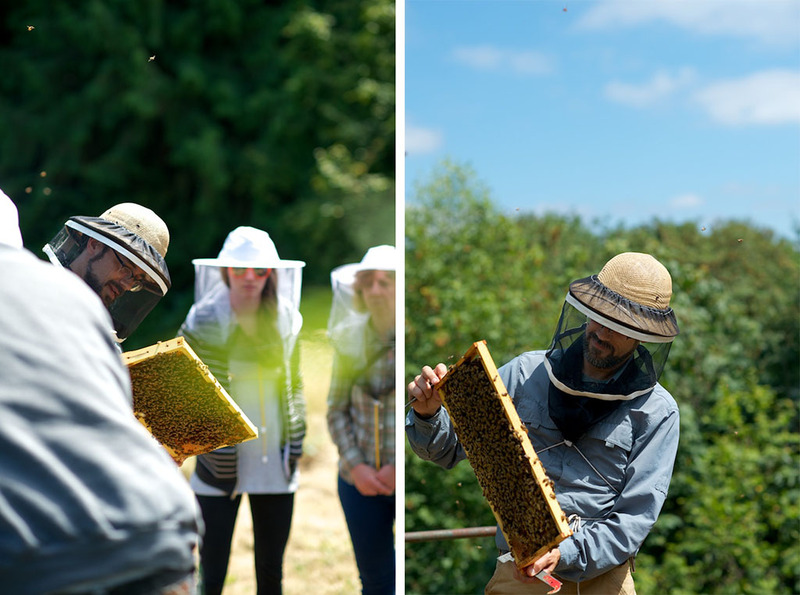 There are multiple points of entry to learning about bees and beekeeping: you can find where to buy the honey; you can take a beekeeping class like the one I observed or become an apprentice; you can host a hive or learn how to make beeswax; or you can be an inadvertent participant just by flying out of the Sea-Tac airport. A current annoyance surrounding discussions about our food system, whether how to stop devastation like CCD, counter antibiotic resistant bacteria, deal with drought, or even how to successfully put a healthy dinner on the table, is that our society is looking for a simple, quick fix to complicated, multifaceted problems. Nature and agriculture and food aren’t black and white systems, where a spray of a certain pesticide will solve all of your pest problems or taking a fish oil pill will automatically improve your heart’s health. Beekeeping means more than acquiring a few hives and hoping for some honey at the end of the process. 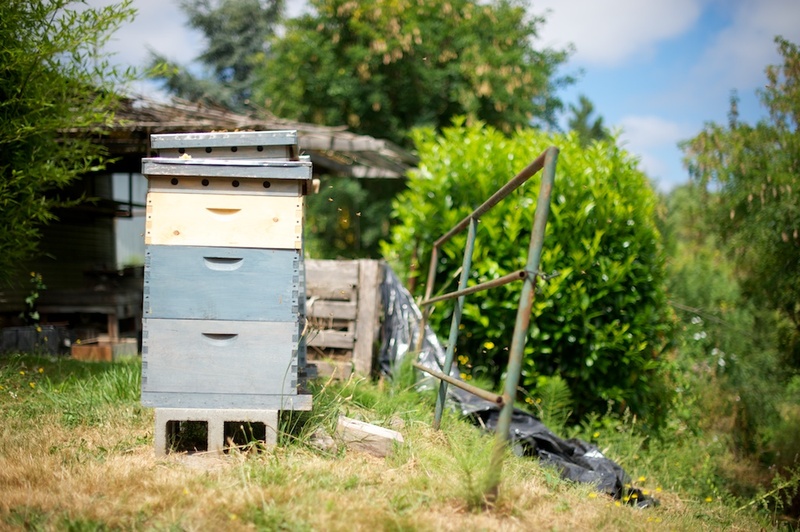 In fact, aspiring beekeepers must consider a hive’s location in the overall ecosystem and find a place that will provide the honeybees with enough nutritious forage, yet steer them clear of as many harmful chemicals and residues as possible. In some cases, jumping on the trendy beekeeping bandwagon without proper research does more harm than good. Consider the current situation in London, where many companies have installed hives to promote environmentalism. There are now an estimated 25 hives for each square mile of the city, and scientists have found that the surrounding area doesn’t have enough food for the bees to forage. Despite good intentions, these situations fall into that simplistic trap of seeing only part of the picture, instead of all of the components interacting in a complicated fashion. Bees offer us a direct glimpse into our own lives, and our role in our surrounding ecosystems. Just as bees are susceptible to illness and disease, humans today are at high risks of autoimmune disorders, cancer, and illness. Eliminating one kind of food from our diet doesn’t make us healthy; banning one kind of chemical doesn’t mean that another chemical isn’t just as harmful. When the problem is systemic, for humans and bees, then the solution isn’t quick and easy – there’s no single fix. 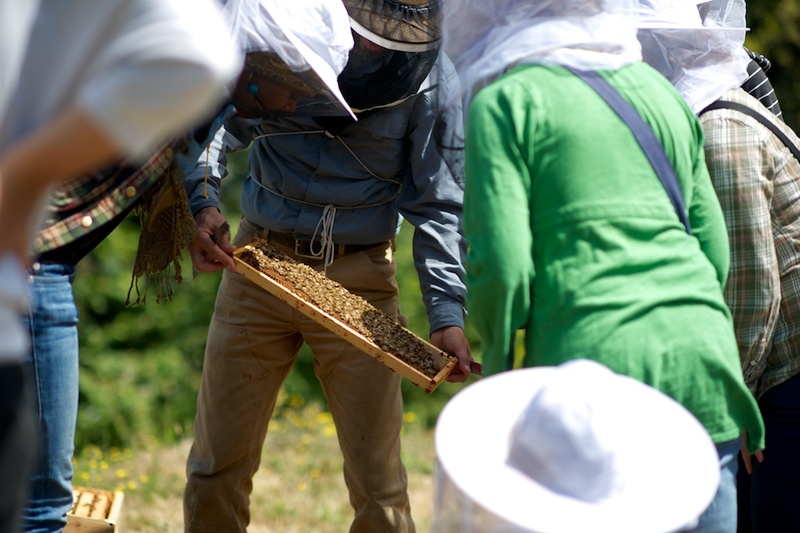 But through the unified intentionality demonstrated by Urban Bee, interconnected beekeeping can foster change in our local food system by using the hive as mirror of our own lives. A healthy bee colony comes from the combination of a conscientious beekeeper, hardy bee-stock, an environment free of chemicals, and nutritious and varied forage. Our needs as humans aren’t dissimilar. The nation’s current industrial food system – and the pesticides, polluted run-off, processed foods, and destroyed wildlife habitats that come with it – is leaving a negatively indelible impression on our communities and environment. 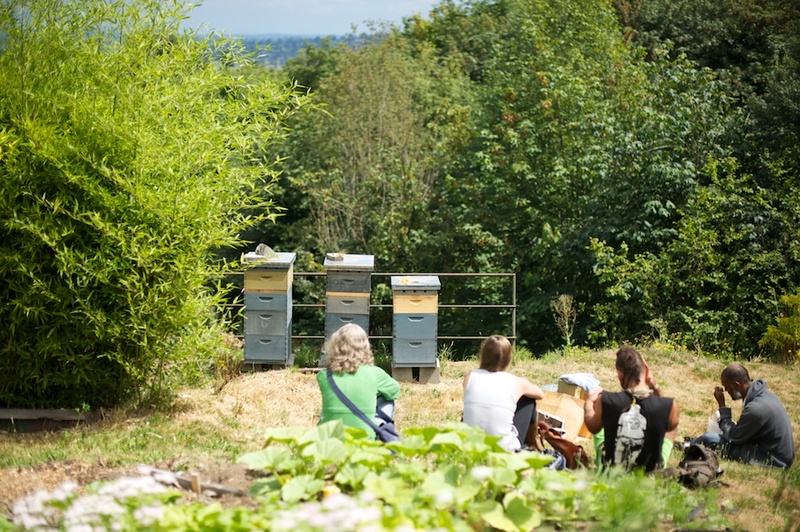 The best way of addressing these challenges is to follow Redmond and Urban Bee’s example, in holistically nurturing the community around the hive.